In the US, what are the guidelines on how one should receive Holy Communion? Those who receive Communion may receive either in the hand or on the tongue, and the decision should be that of the individual receiving, not of the person distributing Communion. If Communion is received in the hand, the hands should first of all be clean. If one is right handed the left hand should rest upon the right. The host will then be laid in the palm of the left hand and then taken by the right hand to the mouth. If one is left-handed this is reversed. It is not appropriate to reach out with the fingers and take the host from the person distributing. Source: The Reception of Holy Communion at Mass | USCCB. For the Holy See's position, please see: Communion received on the tongue and while kneeling | Office for the Liturgical Celebrations of the Supreme Pontiff. The most ancient practice of distributing Holy Communion was, with all probability, to give Communion to the faithful in the palm of the hand. The history of the liturgy, however, makes clear that rather early on a process took place to change this practice. From the time of the Fathers of the Church, a tendency was born and consolidated whereby distribution of Holy Communion in the hand became more and more restricted in favor of distributing Holy Communion on the tongue. The motivation for this practice is two-fold: a) first, to avoid, as much as possible, the dropping of Eucharistic particles; b) second, to increase among the faithful devotion to the Real Presence of Christ in the Sacrament of the Eucharist. 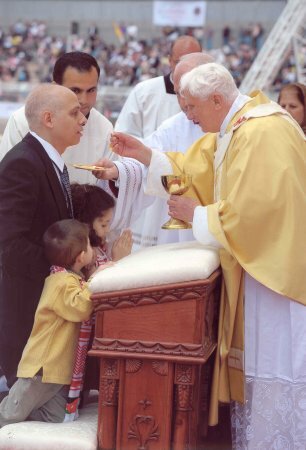 In continuity with the teaching of his Predecessor, starting with the Solemnity of Corpus Christi in the year 2008, the Holy Father, Benedict XVI, began to distribute to the faithful the Body of the Lord, by placing it directly on the tongue of the faithful as they remain kneeling. For the history of Holy Communion in the hand please see: Library: Holy Communion in the Hand? By Paul Kokoski | Catholic Culture. Please see also: Communion in the hand: Documents and History | Most Reverend Juan Rodolfo Laise, Bishop of San Luis, Argentina. Please see this video: Make Of Our Hands A Throne. Typical reception of Holy Communion in the US. (OP: withholding comments). It is important to note that no bishop or bishop conference decide on their own what manner Holy Communion should be received by the Faithful. They must first petition the Vatican for an indult and a concession be granted. cf. Communion-in-the-Hand | EWTN. For the communicant, the reception of Holy Communion by whatever manner that is approved in their own diocese ought to be done with the right and proper reverence due to the One being received. In my diocese the Bishop asks that the communicants bow before receiving Holy Communion, which they do standing. @AndrewLeach has shared "The practice [...] of not handing the chalice to each communicant is actually laid down in the General Instruction of the Roman Missal." This is something not observed in my parish and therefore worth investigating further. practice in the Personal Ordinariate. The practice mentioned in §38 of not handing the chalice to each communicant is actually laid down in the General Instruction of the Roman Missal, although in England & Wales at least that exhortation appears to be widely ignored. Receiving Communion on the tongue and kneeling has always been and still is the norm for Catholics. The founders of Protestantism (Luther, Cranmer, et al.) advocated Communion in the hand to emphasize, against Catholic teaching, that a consecrated Host is just bread (Deus panis factus). In approaching, therefore, come not with thy wrists extended, or thy fingers spread; but make thy left hand a throne for the right, as for that which is to receive a King. And having hollowed thy palm, receive the Body of Christ, saying over it, Amen. So then after having carefully hallowed thine eyes by the touch of the Holy Body, partake of it; giving heed lest thou lose any portion thereof; for whatever thou losest, is evidently a loss to thee as it were from one of thine own members. The dispensing of Christ's body belongs to the priest for three reasons. First, because…he consecrates as in the person of Christ. But as Christ consecrated His body at the supper, so also He gave it to others to be partaken of by them. Accordingly, as the consecration of Christ's body belongs to the priest, so likewise does the dispensing belong to him. Secondly, because the priest is the appointed intermediary between God and the people; hence as it belongs to him to offer the people's gifts to God, so it belongs to him to deliver consecrated gifts to the people. Thirdly, because out of reverence towards this sacrament, nothing touches it, but what is consecrated; hence the corporal and the chalice are consecrated, and likewise the priest's hands, for touching this sacrament. Hence it is not lawful for anyone else to touch it except from necessity, for instance, if it were to fall upon the ground, or else in some other case of urgency. How long are extraordinary ministers allowed to possess the Eucharist? Does transubstantiation occur when the Eucharist is received by one barred from sacraments?